As an athlete staying fit has always been very important to me. Growing up I competed in gymnastics which kept me in shape and flexible. I continued to stay fit by going to the gym and running recreationally before finding a true passion for triathlon in my late 20’s. Since that time I have been racing half and full distance triathlons up until the last 2 years when I became sidelined with 2 stress fractures in my foot. After taking time off for the stress fractures, I am now happily spectating as an expectant, first-time mom. Although at 43 I am considered “advanced maternal age,” I am very pleased with how remarkably well I have felt throughout my pregnancy even until now at almost 36 weeks! Though I get tired, I still have lots of energy and have not experienced the swelling that is common in many pregnancies. I’ve gained 22 pounds and attribute my healthy pregnancy to eating healthy and staying active. I never wanted to use pregnancy as an excuse to stop working out and “let my body go” or feel like I could “eat whatever I wanted” and gain lots of extra non-baby weight as a result! 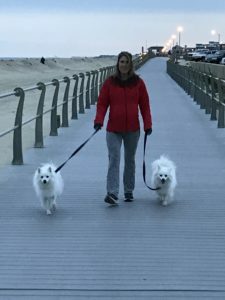 Even though this is my first pregnancy, and I’m not a nutritionist or fitness expert, I wanted to share 7 tips that, even at my age, have helped me stay healthy and fit during my pregnancy. The following is based on my personal experience, body and doctor consultations, all pregnant women should consult with their own doctors when planning their health and fitness routine. Walking: Walking is great because it is low impact and can be done anytime and anywhere. 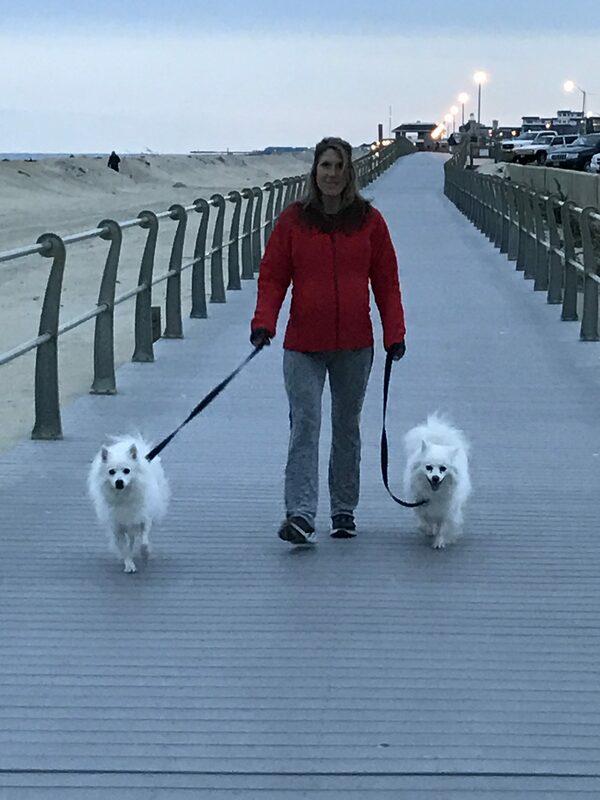 I have 2 high-energy American Eskimo dogs that help keep me in shape! I walk with them about an hour a day. In my earlier months I ran occasionally, but I stopped mainly due to my lingering foot injury. Also, it became uncomfortable on the bladder as I got further along in my second trimester. I first checked with my doctor to see if was okay to run in the first place. He advised that I could do just about any exercise that I was already doing prior to pregnancy, but he didn’t recommend starting anything new. 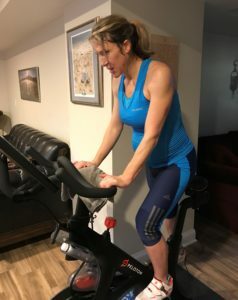 Peloton Cycle: As a triathlete who loves to bike, the Peloton has been my consistent go-to workout, especially during my third trimester when I stopped riding outside on the road. During the early months of my pregnancy in the spring & summer, I enjoyed riding on the road and even did an 80-mile ride on the hottest day of the summer (100 degrees) at 4 months. My doctor did say I can “do anything I was already used to doing,” however, I would not recommend that to most people. The reason I like the Peloton so much, especially during pregnancy, is that I can ride at my own pace, control my resistance, and be mindful not to go too hard and elevate my heart rate, all while getting in a solid workout. I usually take a 1-hour class first thing in the morning about 5 to 6 days a week. I start off by drinking a bottle of XRCEL fuel 15 minutes before I hop on the Peloton to give me steady energy throughout the ride. If you don’t have a Peloton cycle, you can easily download the app to follow a class and ride from your own stationary bike or bike mounted on a trainer. The Peloton also offers classes beyond cycling ranging from yoga and stretching, to light strength training, all of which are ideal exercises for pregnant women. Strength Training: Exercising with light free weights or using resistance equipment at the gym is another great way to stay fit. Working on muscle tone helps maintain lean muscle which increases metabolism to burn fat as fuel. In the beginning, I liked to do some crunches and standard push-ups on the floor, but stopped between weeks 16-20. Some of my favorite conditioning exercises include arm and shoulder workouts with 5 pound dumbbells incl uding tricep extensions, dumbbell curls for biceps, dumbbell fly and incline dumbbell bench presses, and pushups against a raised bar for overall upper body workouts. I also like using the “gravitron” machine at the gym, which allows me to do pull-ups without having to lift my entire body weight. This is good for toning the back, shoulders and biceps. For lower body workout, I like doing lunges using a medicine ball or holding a 5kg kettlebell in each hand. 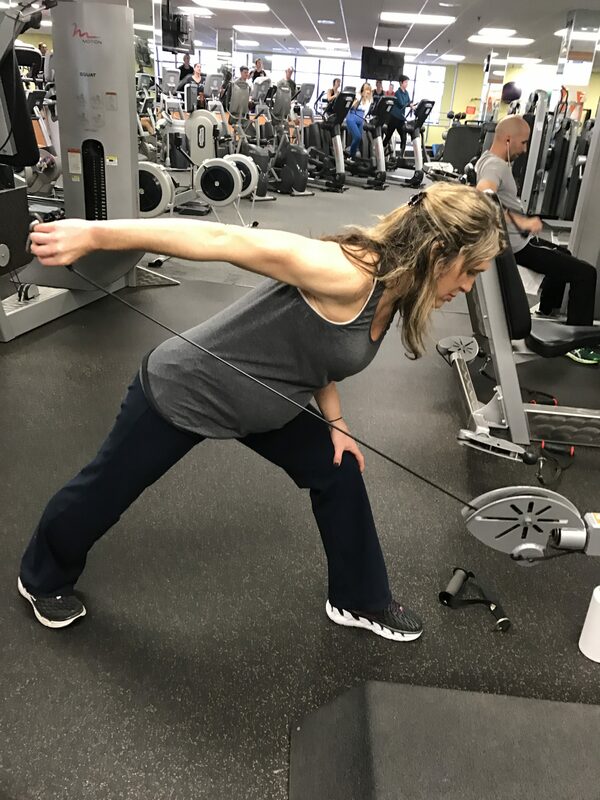 Other strength-building leg exercises that are a part of my routine include squats with my own body weight or while holding a light weight kettlebell. To mix it up, I hit the gym machines to do leg presses and leg extensions using low resistance. I don’t have a precise schedule with my weight training. I’ll just make sure I mix in both lower body and upper body about 45 minutes to an hour, twice a week. This is enough for me because I do some form of cardio 6 days a week between riding on the Peloton, walking or swimming. Most importantly with all of these exercises is to listen to your body and stop if your body feels stressed. Swimming: You’ve probably heard already that swimming is one of the best exercise you can do while being pregnant. It helps maintain your aerobic capacity and is very low impact with the water helping to support your body weight. As with all exercises during pregnancy, it is important not to overly exert yourself and keep your heart rate between 120 and 140, but always check with your doctor. 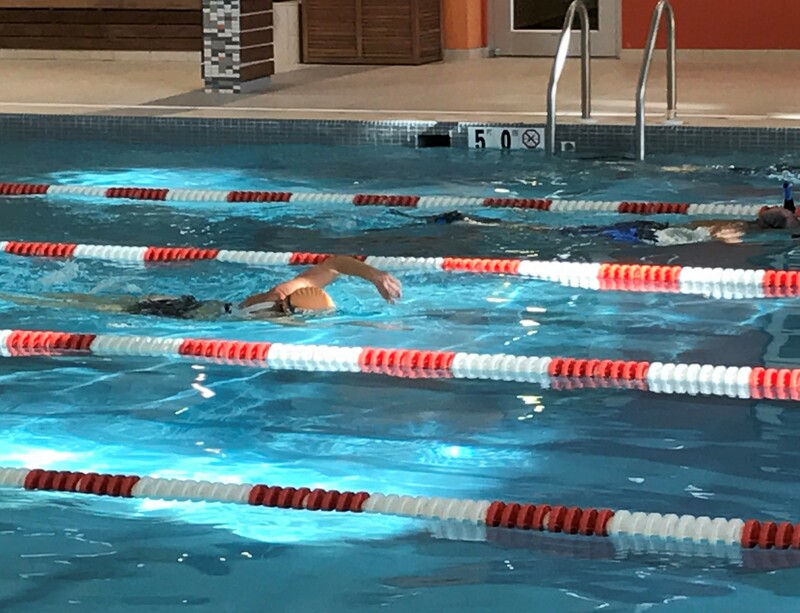 It’s ironic that I have raced in many triathlons over the years, including 9 ironman races, and yet I feel that I have enjoyed swimming much more now that I am pregnant! I have been more consistent with swimming than I’ve ever been prior to being pregnant. Most people who know me know that in the past I would always favor biking and running over swimming. I now have a new appreciation for swimming! 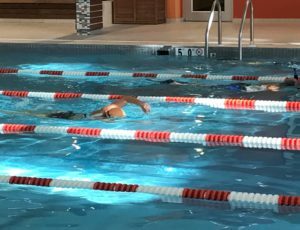 Not only is swimming great for endurance, it just feels really good and is more comfortable than most of the other exercises while pregnant. My gym has a saline pool which makes me feel more at ease, even though I’ve read that chlorine pools are still safe for pregnant women. I usually fill my weekends with a swim of about 45 minutes to 1 hour and shoot for another day or two to hit the pool again. Whether I ride the Peloton, strength train, or swim, I’ll grab a bottle of XRCEL Fuel 15 min before my workout to give me sustained energy and stave off my hunger. Water– It may sound cliché, but drinking plenty of water is extra- important during pregnancy, especially when exercising. It is recommended to drink 12 to 13, 8-ounce glasses per day. I fall short of this most days, but I’m drinking way more water than ever before. Staying hydrated helps absorb essential nutrients in the red blood cells that are transported to the baby. The blood flow also helps lessen fatigue and reduce swelling. I try to have about 8 to 10 glass of water per day and feel it is one of the reasons I have not experienced any swelling so far. The only downfall is I am constantly running to the bathroom! I am also mindful of drinking only filtered water or bottled water. Even though our public water is deemed safe to drink, I just don’t trust any water from the tap. There could be harmful chemicals, bacteria, or pollutants in the water that I don’t know about and is not safe. Before becoming pregnant, I would get much of my water from drinks like low-cal Gatorade or other low calorie drinks like vitamin water, but now I stay away from any drinks with sugar substitutes and aim to drink lots of water to stay hydrated. I find it much more refreshing and satisfying and plan on continuing to drink a lot of plain water after pregnancy. 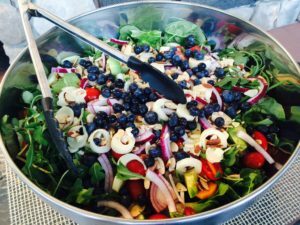 Healthy fats & fruits: I’ve always considered myself a healthy eater, but it’s even more important to follow a well-balanced, nutritious diet while eating to benefit the development of a growing baby. The biggest changes I’ve made while pregnant is adding more healthy fats to my diet. It is especially critical for the brain development of the baby. I used to be afraid to eat too many calories from fats, but now I find ways to include fats and oils in my daily diet. For breakfast, I add a tablespoon of flaxseed oil to my cereal. For lunch and dinner, I also will mix in avocado and a handful of nuts such as walnuts, almonds, or pistachios. to my salads. For salad dressing, I skip the low cal dressings, which are loaded with sugar substitutes and fake sugar. Instead, I use wholesome olive oil or walnut oil with white or balsamic vinegar. I’ve also been adding real butter to fiber rich slice of spread with dinner. In the past I removed the yolks from hard boiled eggs, but now if I have 3 eggs I’ll keep 2 yolks to benefit from the rich, fat soluble vitamins and essential fatty acids. It is also a great source of protein and good cholesterol. When buying eggs I make sure to check the expiration date and that the eggs are organic and not treated with antibiotics or hormones. In addition to eating healthy fats, I’ve found that I’ve been craving even more fruits in my diet, especially during the summer months. Some of my favorite fruits are apples, pears, bananas, watermelon, blueberries, raspberries, oranges, and grapes. All of these fruits are nutrient dense with essential vitamins, minerals, and antioxidants that foster healthy growth and development. Aromatherapy- I’ve always been intrigued by the health benefits of aromatherapy. I love walking into a room with a nice scent that is not overpowering. While I enjoy the smell of candles, burning candles can be toxic so I rarely burn scented candles. Aromatherapy is a technique featuring essential oils extracted from plants to boost your health and overall well-being. Essential oils are the LIVE essence of the plant. Unlike herbs, which are dried, essential oils carry all the active chemical constituents within the plant, which is why they are known to be so therapeutically effective. Some of the benefits of essential oil therapy during pregnancy include relief from tension, nausea, headaches, swelling, and fatigue. Aromatherapy can also help promote relaxation, improve sleep, boost immune system, and enhance mood. It wasn’t until my third trimester that I started incorporating aromatherapy (www.doTerra.com) into my weekly routine. I use a diffuser to diffuse some of the essential oils for about 15 minutes at a time, which releases the natural aroma. While I still have much to learn about aromatherapy, my primary interest is in stress relief and boosting my immune system. I’ve also found that some of the essential oils such as peppermint and citrus oils, including orange and grapefruit, are invigorating and help give more energy. Before using aromatherapy, it is always best to talk to your doctor or holistic specialist to learn how to safely and effectively use it in your home. There are specific essential oils that are recommended and deemed safe for each trimester. Some of my favorite essential oils I’ve used during my third trimester are lavender, frankincense, aromatouch, and lemon. I am grateful to have had a healthy and smooth pregnancy with ample energy so far. I feel that keeping a consistent, daily exercise routine, eating healthy, and minimizing stress are essential components of a problem-free pregnancy leading to a healthy baby. I took many cycling classes in my college years. I’m now in my late 20’s with one child and have expectations of becoming pregnant in the next few months. Going to the gym has become increasingly more difficult with work, hubby’s availability to watch our daughter and life. I’m considering getting a peloton in the next month. I’ve stayed in shape over the years and my last pregnancy, but not necessarily specific to cycling. Would you recommend I make the investment starting as a beginner cyclist again and (soon) early in pregnancy? Thank you for reaching out to us. It is always recommended that you speak with your obstetrician about adopting any exercise regime during pregnancy. If your doctor does clear you for cycling, I personally found using my Peloton while pregnant was very convenient and helped me stay active and fit without stressing my body. I was able to modify my effort and intensity without letting my heart rate get high. For me personally, it was one of the best investments we made and now that I have a child, it is even more convenient and allows me to stay in great shape. It is also a fun way to exercise with great coaches and a variety of classes that are offered through the Peloton. – Laura DeMeo, Manager Business Development -Endurance Sports, Team XRCEL.